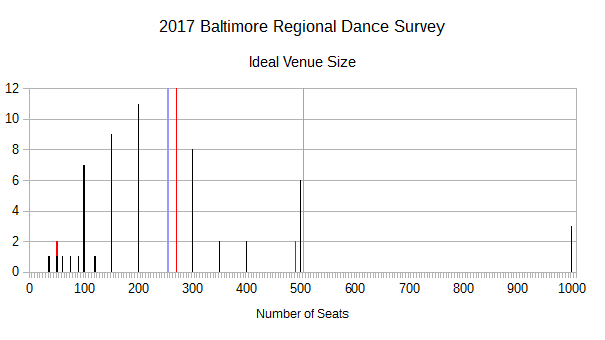 A quick post here just to point to the Baltimore Regional Dance Survey 2018 Edition. Data collection is live now. Thanks to the dancers that helped de-bug this version of the survey. 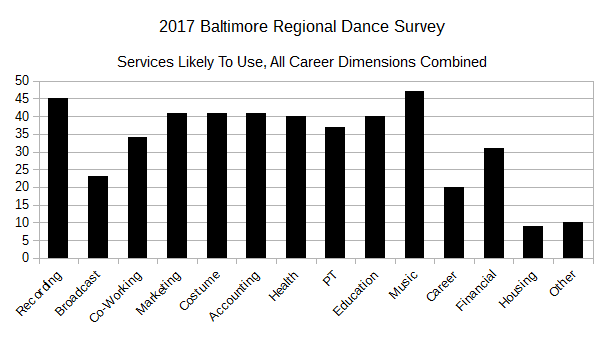 In 2017, In the Dancer’s Studio (with students at Towson University) surveyed dancers in the Baltimore region to gain some perspective on what they were doing, what they could be doing, and what was keeping them from doing those things. An analysis of those responses is here. This year, we’re out of the classroom and into the real world. With a few tweaks and some streamlining of the questions, we’re trying to expand the reach of the survey to address a number of sampling biases from 2017. Please share this survey with every dancer, of every level. The experiences of the fresh, new dancer are just as important as the well-established studio owner. The more data collected, the more likely it is to be meaningful and useful in shaping policy and channeling resources for dance. Based on previous work, we estimate there are some 60,000-100,000 active dancers in the region. 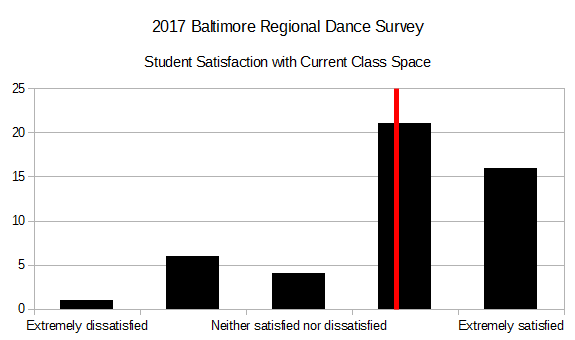 Please help share this survey with your colleagues, partners, students, teachers, and any other people active in the Baltimore region’s dance community so we can gather enough data to fairly represent the whole community. This year, we have a new token system that allows you to stop and resume the survey at your convenience, and you can go backwards to answer questions you skipped or modify previous questions. The system uses email to verify your participation, so if you don’t see email as expected, please check your spam filters. Please answer as fully and honestly as possible. All questions are optional except the first one (it determines which other questions are relevant to you). 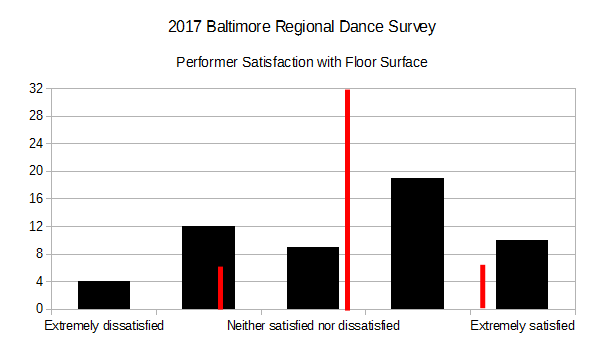 With this post, I’m wrapping up the first pass through the Baltimore Regional Dance Survey 2017 Edition. It’s far from formal (no footnotes! and I’m trying to keep a friendly, accessible tone), but this series of posts is something on the order of 9000 words (plus the thousand or so coming below) and over 160 charts (and these aren’t even the good charts!). So, there is much to discuss, and the floor (or at least the comment sections) are yours. I’ve glossed over several things (services supplied, class space satisfaction) and skipped others almost entirely (class size, non-class expenses, geography of instruction venues, geography of performance venues). In time, I’ll come back to these with enough context to make them meaningful. 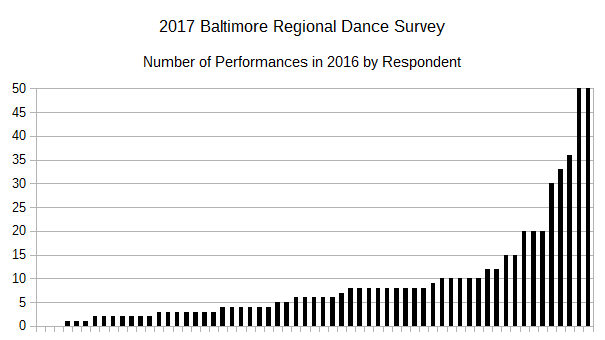 Having said that, I hope this proves to be a meaningful and useful set of publicly-available data for participants in the Baltimore regional dance community to reference. It is a small sample, and I hope to improve on that in the future (your suggestions are welcome). 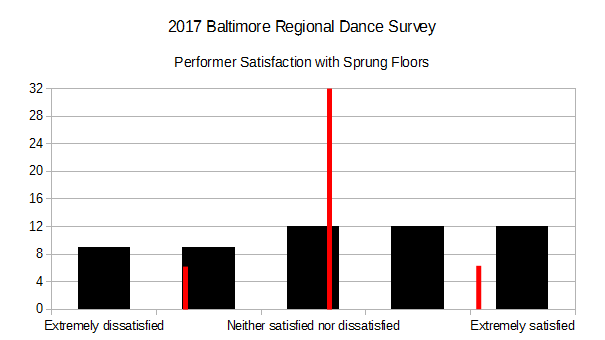 It’s a biased sample, skewing heavily toward older instruction-oriented members of the community (there was apparently some confusion about the intent of the survey early in its deployment, and some people thought only “dance professionals” should participate). The survey instrument itself needs some work. The pool of respondents, to make this really meaningful, has to expand to include the beginners and outsiders, the casual and dedicated. It’s a start, and with your help, it may reach those goals. Thanks to everyone that participated, and for those that got caught in the snags and hiccups along the way, I do apologize and appreciate your patience. You are always welcome to comment here on the blog or reach out via this form or email. For those of you that I’ve worked with or will work with in the future, constructive comments, thoughts and criticism is always welcome, however you may find me. With that preamble, let’s take a look at that nagging question at the end. As I teased at the beginning of these posts, the last question was entirely open-ended, “Please describe any other issues that affect dancers or dance development in Baltimore Area.” Describe them you did. Affordable access to studios and a performance space with good floors. This is the main need to grow and support Baltimore’s dance community. We should have more venues throughout the area. Theaters that can be afforded have poor lighting and sound. I wont say we have a venue to properly perform a yearly showcase. Rentable rehearsal space which is private (has a door), has a ceiling taller than 10′, and allows heels. Performance venues with ceiling height taller than 10′, a small private dressing area separate from audience circulation, stage floor WITHOUT carpet. When we first started teaching 28 years ago, line dance venues were abundant. Unfortunately, these venues have slowly dried up over the years. Just wish there were more venues in the area! I’d love affordable space where I can rehearse my own work and a venue to showcase new works. We need more collaborative spaces for dance in Baltimore. It would be nice if a space could be defined with dance activities that would bring different dancers together in one venue. Affordable and available performance space is a major concern, possibly a dance center-one location for a variety of dance activity. There needs to be a venue/performance space that caters to dance as well as fostering a community. There is also in my opinion not enough quality modern classes for dancers to take in an open class setting. I tend to travel to NYC or DC to take a modern class–one that is built on deepening knowledge of a technical and artistic foundation rather than improv or performance art. Very few classes beyond beginning ballet are available for adult dancers. We need more dance classes in Baltimore. There are not enough quality dance classes for the advanced dancer in the city of Baltimore. I would like to see more open classes for adults/professionals without the commitment to a company. Not having enough funds to pay dancers. Many dancers have job commitments, no cars and lack of funds to attend to regular dance classes. 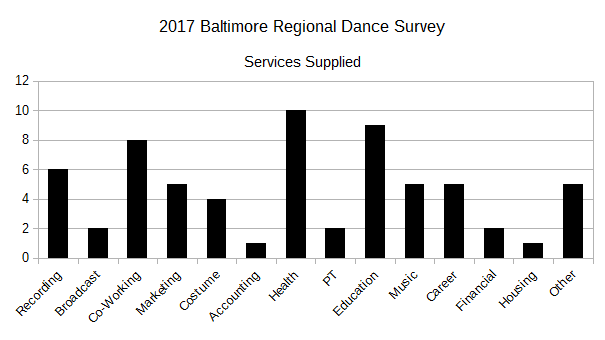 From my point of view, issues such as transportation, time and money affect dancers in the Baltimore area that I work with. We have no major dance companies that can support a dancer for full time work. 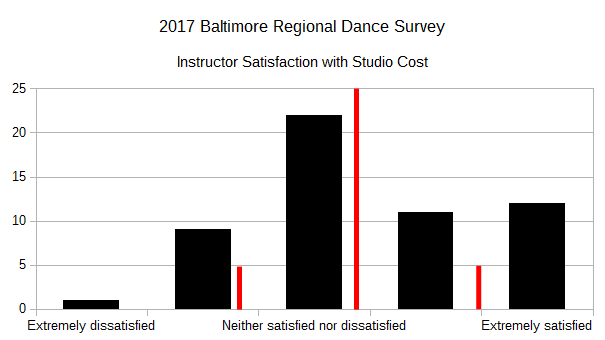 There is quite good training for dancers in Baltimore but then they must leave Baltimore if they are looking for professional work outside of teaching. Finding professional level opportunities that are diverse/reputable and for which artists get paid. Retention in local dance companies suffers from lack of dance opportunities/community. Veteran Black Non-classical dancers/instructors do not get as many open doors or compensation, as their Caucasian counterparts. Accessibility and facilities in compliance with ADA. Ongoing professional dance performance presentation (national companies appearing in the area regularly) would positively effect dance development in Baltimore–inspiring young dancers, demonstrating excellence, possibly creating opportunities, and more. You have to travel in unsafe areas. In my field of Mexican Folk Dance I wont say we have enough exposure. Exposure to media to promote the arts. There is not enough support. So with that, and your issues on the table, I invite your feedback, comments, and suggestions. As I’ve said in a few places throughout these posts, I’m happy to address specific issues individually if you’d like to reach out. In the meantime, I’ll continue to do what I can to map (and eventually change) the landscape of dance in Baltimore for the better. Sticking with the performance dimension for a little while longer, respondents were asked “What is the ideal seating capacity needed for your performances?” 54 respondents provided responses ranging from 35 to 1000. There were no responses higher than 1000, which apparently makes spaces like the Hippodrome and Lyric less than ideal. This question is only about capacity, which keeps things fairly simple. There might be enough here to do some future commentary about capacity and capabilities… we’ll see. Average for all respondents is 270 seats. The most popular response (mode), with 11 respondents, is 200. Having said that, there are three ranges that look interesting – the 35-200 range (effectively 0 to 250), the 300 to 500 seat range (effectively 251 to 500), and the 1000 seat range (let’s call that 501 to 3 billion). Conveniently (because we made it that way), the size in each range doubles, so that’s nice and geometric. Those ranges are indicated in the charts with the pale separators. In this category, the responses were amazingly similar in all categories – with a slight bias toward satisfaction. Fairly neutral responses when it comes to the floors in performance spaces. While the overall results are neutral (Average = 3.81 where 4.00 = “Neither Agree nor Disagree”. 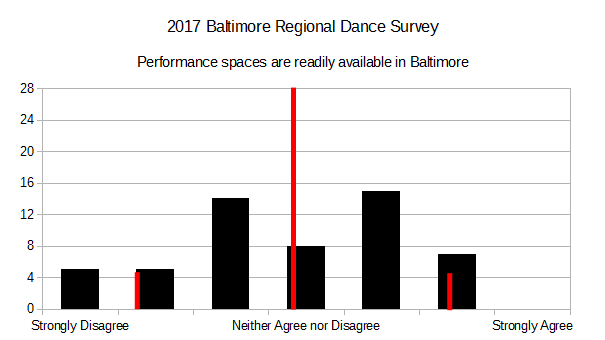 σ = 2.10), there is an immediate takeaway – out of 54 respondents (still a small sample), none of them Strongly Agree with the sentiment that performance space is readily available in Baltimore. After a bit of a break to actually make some dance performance stuff happen, it’s time to get back to the BRDS data. Having spent some time exploring learning and teaching, I finally get to dive into the performance dimension of dance in Baltimore. We start with some simple questions… How often did you perform in 2016 and where? Having completed the student-oriented portion of the BRDS, the instructors are next. First, the perpetual reminder that the respondent pool for this survey is biased toward instructors with significant experience. The average of 48 responses to this question is 2.9 (scale 0 = “Extremely Dissatisfied”, 4 = “Extremely Satisfied”), putting the consensus firmly into the “Somewhat Satisfied” category.